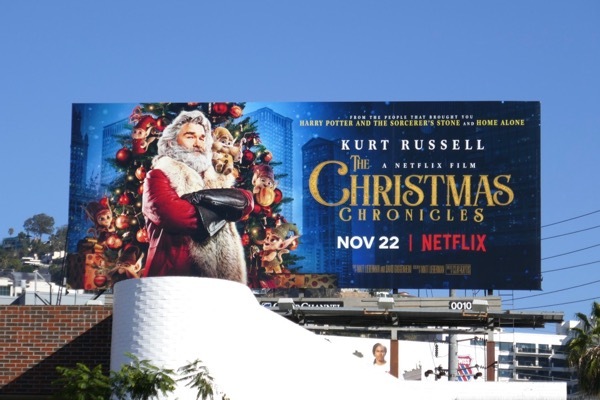 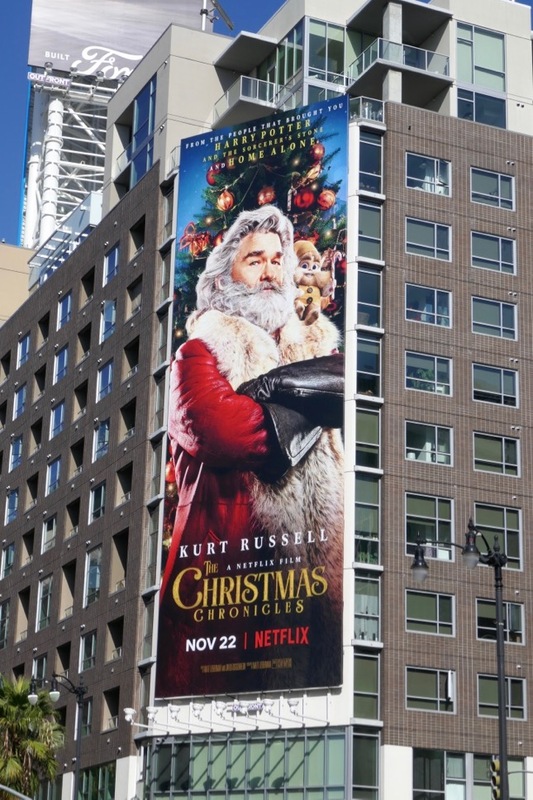 Even though Netflix released The Christmas Chronicles on Thanksgiving for families to enjoy, call it tradition but Daily Billboard just had to wait until the first of December at least to show the skies filled with Santa Claus. 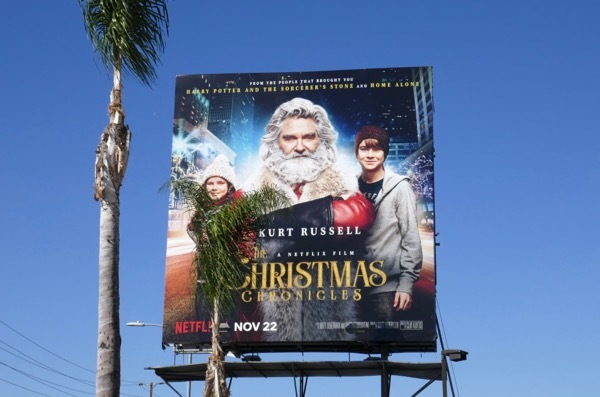 Kurt Russell stars as Saint Nicholas in this original offering from the streaming giant, teaming up with some kids who are trying to catch him on camera to help him save Christmas. 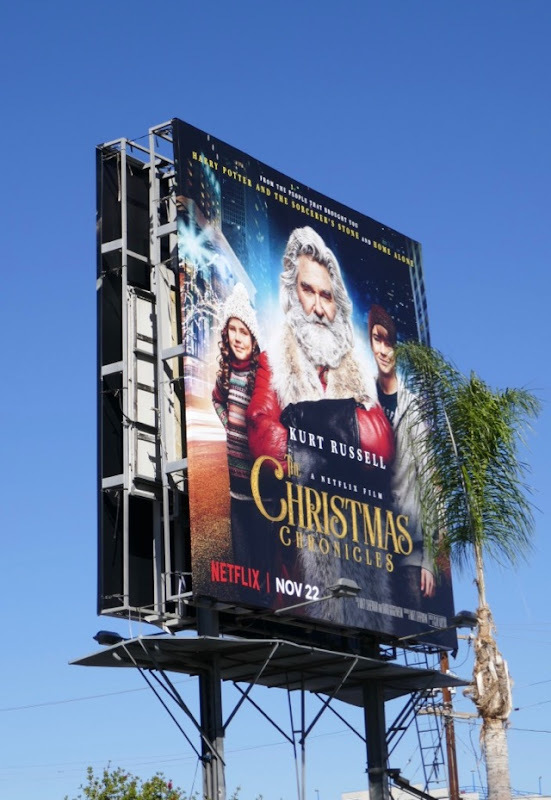 He joins the growing list of actors that have played the infamous jolly gift-giver in the red and white suit, including the likes of Richard Attenborough, Ed Asner, Lloyd Bridges, Beau Bridges, Tim Allen, John Goodman, Robert Wagner and many more besides. 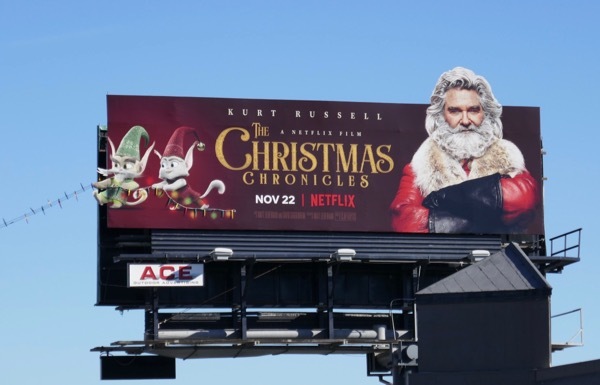 Kurt Russell certainly looks the part so let's hope this sleigh ride of elves, reindeers, presents, decorations, twinkling lights and snowy escapades can get you in the holiday spirit if you're not already. 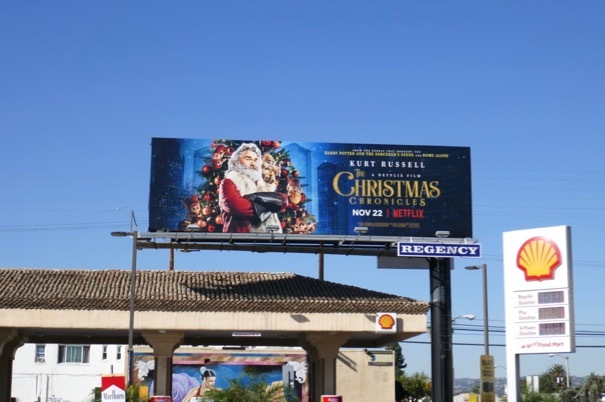 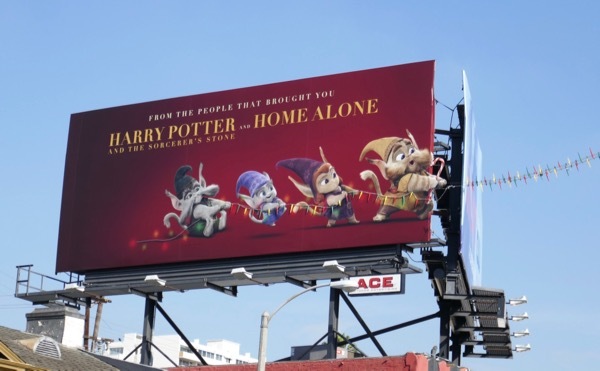 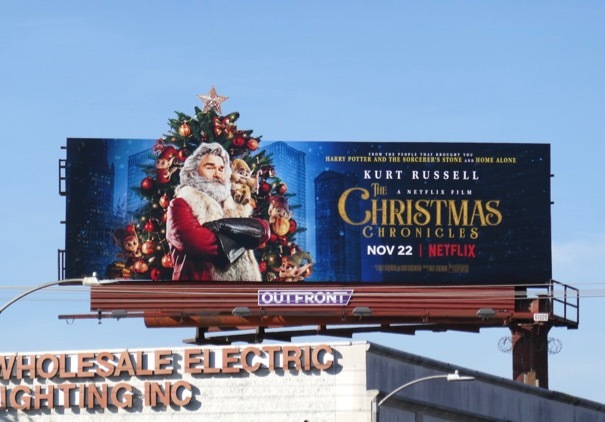 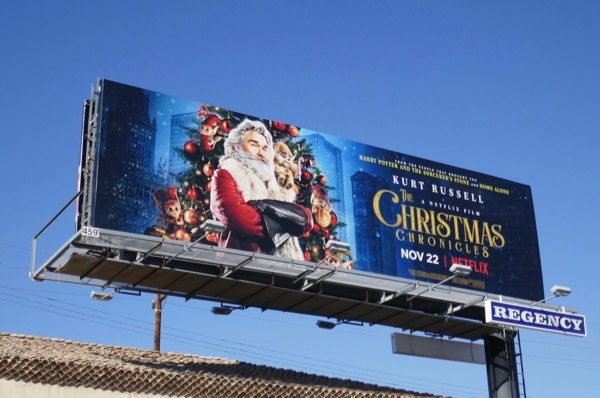 These festive film billboards were photographed along Beverly Boulevard, Fairfax Avenue, Santa Monica Boulevard and Overland Avenue from November 10 to November 16, 2018. 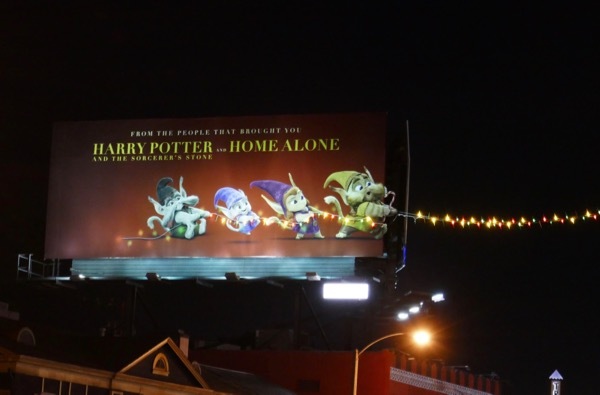 Meanwhile if you were to drive along West Hollywood's Sunset Strip you'd be treated to an even more festive sight at night, with a elven tug of war with illuminated Christmas string lights over the busy commuter artery. 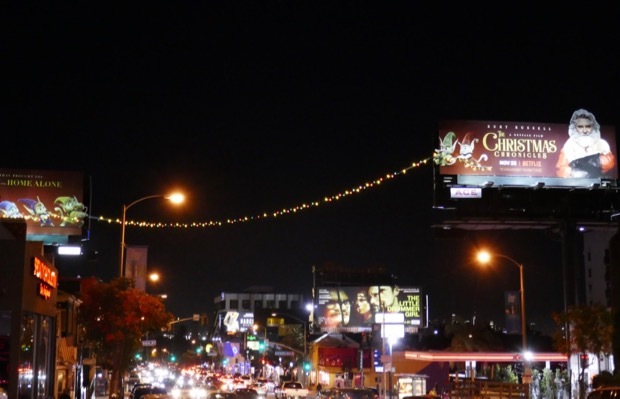 This wonderful installation of Christmas lights was photographed by day and night on November 27, 2018 (and it's also extra appropriate today as it's National Christmas Lights Day). 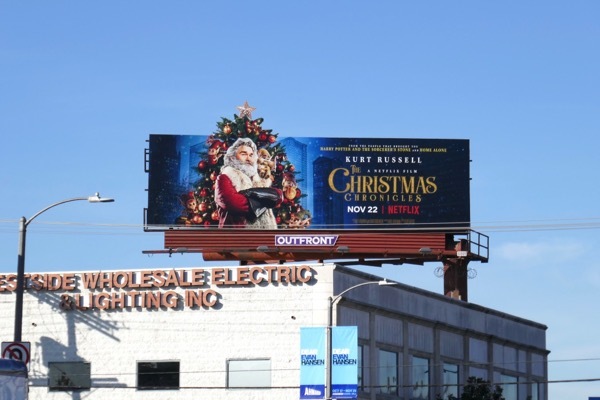 It makes for an eye-catching holiday season spectacle and reminds Daily Billboard of a similar hanging polaroid gimmick for 13 Reasons Why earlier this year. 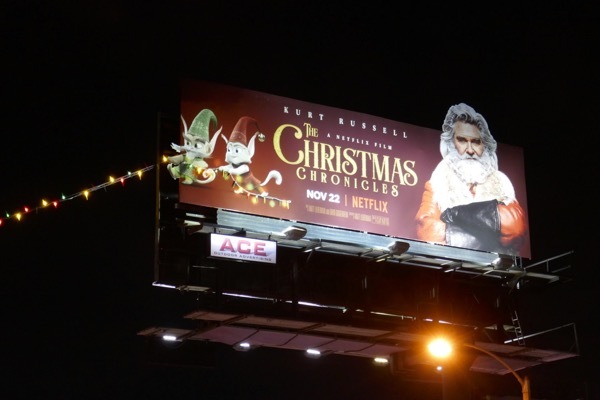 Fans of Father Christmas can also check out all these Coke Santa billboards and these jolly GNC Live Well Santa billboards, whilst for a different take on Kris Kringle enjoy these Rise of the Guardians film billboards and these Bad Santa 2 movie billboards. 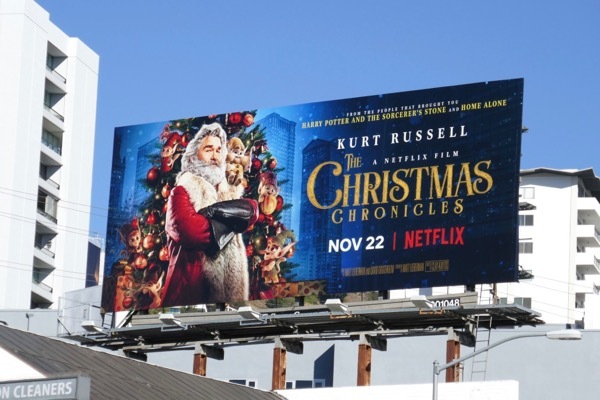 And if The Christmas Chronicles doesn't satisfy your Yuletide cravings, then there's always joyful treats like Elf, Love Actually, Miracle on 34th Street, Home Alone, The Grinch, Scrooged, It's a Wonderful Life and The Muppet Christmas Carol for starters to fill you full of holiday cheer. 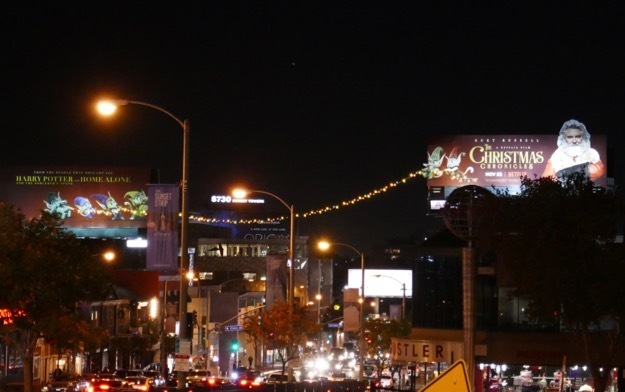 Let the merry countdown begin because it's beginning to feel a lot like Christmas. 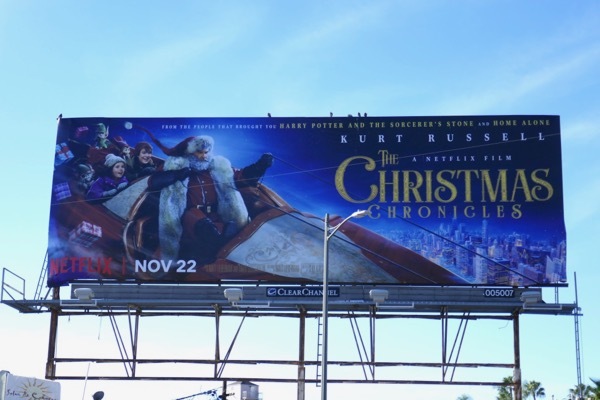 UPDATED: Here's also another billboard creative featuring Santa's sleigh spotted flying above Cahuenga Boulevard on December 1, 2018. 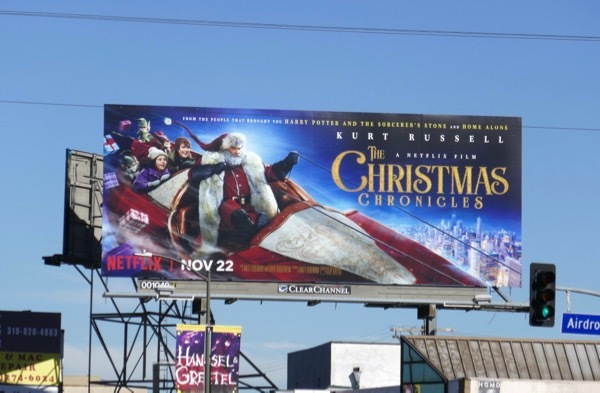 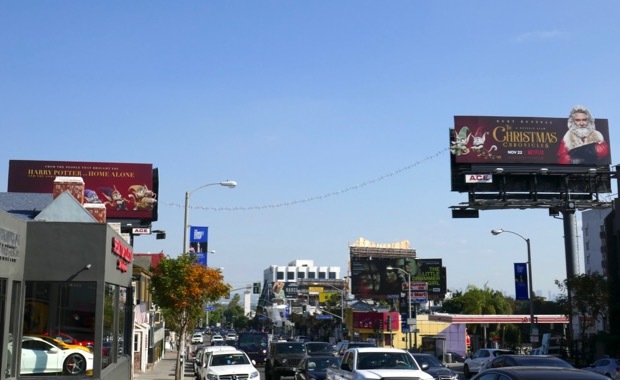 And here's a better example of the sleigh billboard spotted flying over La Cienega Boulevard on December 4, 2018.